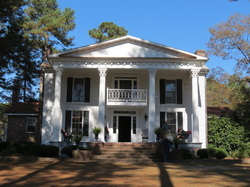 In November of 2013, Joan Adler and Catherine Smith were invited to Georgia for a series of events and presentations relating to the history of the state and the Straus's connection to Georgia. The following events took place between October 31st and November 5th. The first slideshow contains photographs taken by Harold Kurzman, the Great-Grandson of Isidor and Ida Straus and Board member of SHS. Harold was kind enough to join us in Georgia to represent the family and the Society at most of the events. This slideshow includes photographs taken by Catherine Smith, Assistant to the Executive Director of SHS. On October 31st, Joan Adler gave a presentation about the early Straus history in Georgia sponsored by the Talbot County Historical Society. After a pot-luck dinner, hosted by Michael H. and Debbie Buckner of the Patsiliga Museum in Junction City, GA, Joan Adler spoke, followed by Harold Kurzman, the great-grandson of Isidor and Ida Straus, who remarked on his family heritage and his and SHS's plans for their time in Georgia. This presentation was the beginning of the annual Harvest Days in Old Talbot held on November 2 & 3, 2013 from 10 am to 5 pm. On Friday, November 1st, Joan, Catherine, and Harold Kurzman were given a tour of Talbotton by Debbie Buckner. They toured many sites, including Straus-LeVert Memorial Hall, the site where the Straus home once stood, and the last home the Strauses lived in before they left Talbotton for Columbus. In the evening, Joan Adler gave a presentation about her book For the Sake of the Children followed by a book signing. The presentation took place after the 7:30 service at Temple Israel, located at 1617 Wildwood Avenue, Columbus, GA 31906. Members of the temple gathered for a pot-luck meal and for Friday services led my Rabbi Beth Schwartz. After the presentation, Joan Adler signed copies of her book. Over 50 guests were in attendance. "Harvest Days in Old Talbot"
Talbot County was created in 1827 and the wave of new settlers brought their families there in search of farm land. One of the oldest continuous businesses in Talbot County is the Fielder's Water Power Grist Mill. During "Harvest Days in Old Talbot," visitors saw the mill grinding meal, flour, and grist and were able to see a 1896 Lummus Cotton Gin. 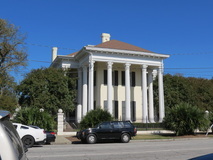 Up the hill is the 1840 Greek Revival home originally built in Talbotton by John W. Attaway, later known as the Daniel, Raines, Passmore Place (Pictured Right). The downstairs of this historical home was open to tours. Many other demonstrations, exhibits, vendors and activities were available. Joan and Catherine set up photographs, books and other informational materials in the dining room. During the weekend, over 500 people passed through the property to enjoy the old world charm of this incredible Georgia home. On Sunday, Joan and Catherine were invited to tour the Zion Episcopal Church in Talbotton with David and Katherine Johnson. Zion Episcopal Church was built in 1848 in the Gothic Revival style and would have been right down the street from where the Straus family lived. 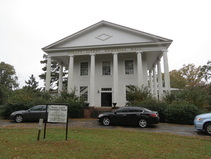 Straus-LeVert Memorial Hall is right across the street from the church. Pictures can be seen in the slideshow above. On Monday, led by Justin Kreig of Historic Columbus, Joan, Catherine, and Harold toured the Walker-Peters-Langdon Home, the Swift-Kyle-Spencer house (Pictured Left) and an old hydro-electric plant on the edge of the Chattahoochee River. They then toured the Springer Opera House with Paul R. Pierce, the historian of the theater. Finally they were given a tour of the Columbus Museum by Gail Greenblatt. 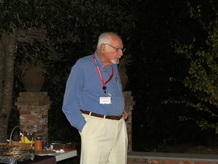 After a long day of touring, the group was met by Dickie Straus for a wonderful southern-style dinner. On June 26th, 2013 the Friends of Straus Park hosted the annual Concert in the Park. Between 5 and 7 pm, the Blue Vipers of Brooklyn played an assortment of early jazz, swing and blues from the 20's and 30's. With chairs set up, the audience grew over the course of the evening, until the rain began at 6:45, cutting the program short. Despite the weather, the performance was wonderful and everyone had a great time. The Blue Vipers of Brooklyn will be returning to Straus Park in October for the annual event Art in the Park. Check Upcoming Events for more information. The video below is just a short clip of the performance by the Blue Vipers of Brooklyn. Enjoy.